This week saw strides toward at least temporarily solving San Diego’s migrant shelter dilemma. On Thursday, Gov. Gavin Newsom came to San Diego to discuss the funding in his proposed budget for a shelter and its new location. The governor touted the progress while flanked by San Diego state legislators, county officials and leaders of the nonprofits that have been operating the shelter. The Rapid Response Network, a coalition of nonprofits and service providers in San Diego, has been providing shelter and care to asylum-seekers being dropped off in San Diego before they connect with sponsors elsewhere in the United States. In late October, the Department of Homeland Security changed its policy of reviewing post-release plans for asylum-seeking families, creating a nightly scramble to shelter the families, provide them with medical screenings and arrange transportation for them to get to their final destination. But the organizations have been raising alarms for months that they’re running out of resources. A city permit for their temporary shelter location – the fifth location since October – is also set to expire in February. On Tuesday, the County Board of Supervisors voted to allow the nonprofits to use the old family courthouse building as a shelter until December. 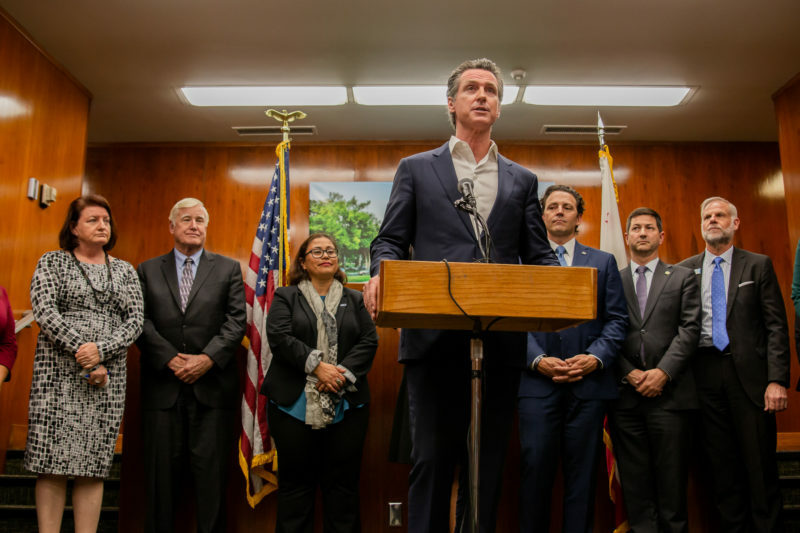 Newsom’s budget proposal includes $25 million over five years for immigration and human-trafficking related issues at the border, of which $5 million could be made available this year for the service providers operating the migrant shelter in San Diego. San Diego legislators have been working to release that money as soon as possible. The budget proposal will go before the state Assembly next week. Newsom also said his administration would be reviewing the work the National Guard has been doing at the border, indicating there may be some changes to the deployment in the near future. This week, Gov. Gavin Newsom appointed San Diego County Supervisor Nathan Fletcher to the California Air Resources Board, a somewhat little-known but powerful state agency. What is the Air Resources Board? First, it’s known as CARB, pronounced just like the things in bread. Second, the 16-member board regulates greenhouse gas emissions, primarily the emissions that come from cars. The agency helped dramatically reduce the smog that choked cities during the middle of the last century. Now, it’s also focused increasingly on climate change-related emissions, which is why it is fighting the Trump administration’s plans to let car companies avoid higher gas-mileage standards. CARB also designed the state’s cap-and-trade program, which is meant to curb industrial greenhouse gas emissions, though a host of local air-quality agencies also still have responsibility for controlling industrial air pollution. The board oversees a $1.8 billion budget and some 1,500 employees. Obviously, an agency that regulates all of this can be quite powerful, sometimes in ways that aren’t immediately obvious. Recently, environmental activists have pushed the board to set higher climate goals for regional planning agencies, like the San Diego Association of Governments. That, in turn, could force local officials to fund more public transit instead of spending money on highway expansions. Fletcher, a Democrat, is now one of two San Diegans on the board, and replaces former Supervisor Ron Roberts, a Republican who was first put on the board in 1995 by Gov. Pete Wilson. The other San Diegan is Diane Takvorian, the executive director and co-founder of the Environmental Health Coalition. Takvorian remains on the board following a bit of intrigue last year, which went largely unnoticed. She first held a spot set aside for an environmental justice advocate, a spot that is appointed by the speaker of the Assembly. In 2016, the speaker was Toni Atkins from San Diego. Atkins put Takvorian on the board. Then, in June, new Assembly Speaker Anthony Rendon replaced Takvorian with former Assemblyman Hector De La Torre. “That’s the pleasure of the speaker,” Takvorian said in a recent interview. That wasn’t the end of things, though. There was another seat open on the board, which was the governor’s to fill. But for whatever reason, Gov. Jerry Brown didn’t fill it fast enough, which allowed the seat to be filled by the leader of the Senate – who is now Atkins. So, in August, Atkins put Takvorian back on the board for a term that ends in 2022. Police groups vehemently opposed a new law opening up records detailing instances of police misconduct, and once it passed, tried to block the law from going into effect. So it doesn’t come as much of a surprise that after both of those efforts failed, many police unions are still making efforts to avoid complying with the law. Police union groups have sued eight local police agencies in hopes of blocking the release of records under the law, NBC San Diego reported this week. “According to the lawsuit, the unions say the law should only apply to investigations that take place after January 1, 2019,” NBC reports. But the author of the law, Sen. Nancy Skinner, wrote in a letter to the Senate Rules Committee this week that the bill was absolutely intended to open up existing records, the Los Angeles Times reported. Meanwhile, two San Diego lawmakers – Assemblywoman Shirley Weber and Sen. Toni Atkins – told CALmatters they’re still in the process of reworking Weber’s effort from last year to change the standards guiding police use of deadly force. State legislators see granny flats – typically backyard units separate from a home – as part of the solution to the state’s housing crunch, and they want to encourage more of them. So, in the wake of a series of successful state bills and more local reforms meant to spur increased development across the state, lawmakers called a joint hearing on Wednesday of the Assembly’s housing and local government committees to discuss how they could help trigger even more granny flat development. “This is a very cost-effective way for us to impact the housing crisis it, and do it in a way that has the least impact on the existing character of a community,” said Assemblyman David Chiu, who chairs the Assembly’s housing committee. Among the solutions discussed were reduced parking mandates for new granny flats and ways to limit zoning tacks that can discourage granny flat projects. Presenters including an analyst from the state Department of Housing and Community Development, the policy director of the UC Berkeley’s Terner Center for Housing Innovation and an attorney representing the state chapter of the American Planning Association also fielded questions about how the state could guide fee adjustments that would incentivize development but also cover costs associated with new granny flats. Multiple San Diego cities have gotten in on the granny flat game. The San Diego City Council has approved measures to ease building requirements, speed the permitting process and reduce costs. Encinitas also recently began offering pre-approved building plans for the small units. San Diego County supervisors also voted in January to waive fees for homeowners who want to build granny flats in unincorporated areas over the next five years. A group of state attorneys general, led by California, are throwing their support behind Imperial Beach. The South Bay city and a handful of municipalities are suing ExxonMobil, Chevron and others. Employing the rationale used against tobacco companies in the 1990s, officials argue that major oil and coal companies should be held responsible for irreversible harms to the environment. That includes rising sea levels, which will damage residential and commercial buildings along the coast. Imperial Beach’s suit was filed in state court and it’s currently pending at the Ninth Circuit Court of Appeals, where the dispute is over jurisdiction. The oil and coal companies argue that the suit should be moved to federal court, where, according to the Union-Tribune, judges have been tossing similar cases. Injuries caused by foreign greenhouse gas emissions, they say, are within the purview of Congress. Now comes California Attorney General Xavier Becerra and other top law enforcement officers, who argue that states are tasked with protecting human welfare and that federal legislation like the Clean Air Act recognizes their role in reducing air pollution specifically.